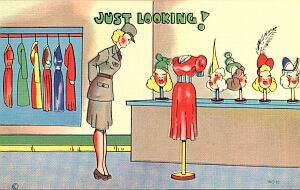 Upon their arrival at the WAC Training Center, enlisted WAC members were issued their uniforms. A wedding, engagement or signet ring, a wrist watch and the identification bracelet were allowed to wear. .... Women could wear their hair long or short. It just had to be worn neat and above the collar (so it couldn't hide the insignia). Therefore long hair had to be pinned up or curled under - but most women had short hair cuts anyway (3 inch length was most popular). .
. Military requirement to properly fit the gas mask to form a tight seal against the possibility of enemy chemical attack was especially important for women who served overseas. In these cases short hair cuts for women were probably recommended to ensure easier donning of the tight fitting masks as well as guarantee optimal protection. Hats always had to be worn outdoors. 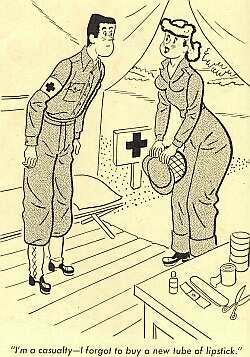 Indoors a WAC could choose if she wanted to keep it on her head (as civilians often did if the hair was messy under the hat after wearing it a long time) or take it off. .v Lipstick, powder and rouge were allowed if showed good taste and kept inconspicuous, as well as light shade nail polish. 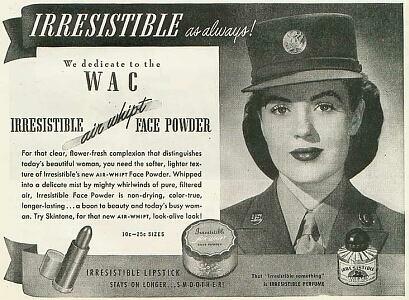 Here the army met the women’s need to look their best even when wearing uniform clothing.
. 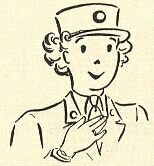 The service uniform had to be worn on all occasions after September 1943. 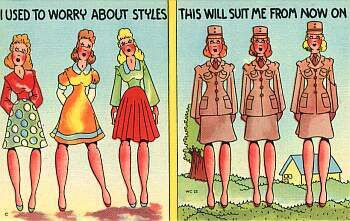 After about the middle of 1944 an off-duty dress was issued for informal occasions or evening wear. 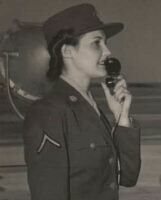 Exceptions could be made when a WAC was engaged in games or sports that required appropriate special clothing or when she was at home with not more than two guests.